Offer Terms: New players, min dep £10. £60 bingo tix + 20 Spins on Starburst. wins capped at £5, WR: 85x(bonus); 8 tix to "£2,500 Real Cash" (real cash wins). 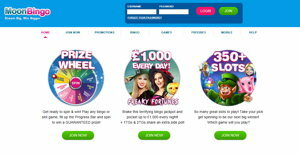 20 tix to "£50 Daily Treat": WR: (4x bingo bonus). Games Bonus wins cap: £400 + the initial bonus amount. Deposit balance can be withdrawn at any time. Wagering restrictions & T&Cs apply. Moon Bingo arrived back in 2009, and is powered by the popular Dragonfish bingo software. The site had a recent update in 2017, and now has amazing new features, games and just a much slicker feel throughout. The theming now offers players a mythical almost fantasy style site, with fairies and castles from far away lands. It’s really bright and fun with a magical vibe, and the gaming on offer is now better than ever. The platform is registered to Cassava Enterprises Ltd, and is licensed and regulated in Gibraltar and the UK. The bingo on offer comes in either 75 or 90-ball variants, and all games are spread across lots of fun themed rooms with massive guaranteed and progressive jackpots. There is also a ton of free bingo on offer too, and a chance to win big on all the social chat room games. There are a massive range of additional slots, casino and side games available too, so you’ll never be short on choice and variety. 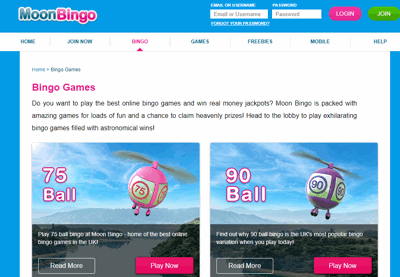 Moon Bingo really hold a great focus on the community side of bingo too, and also really care about the loyalty towards its players. You’ll find fantastic promotions running throughout the year, including an amazing new player offer as advertised above. There’s also extra treats to be gained through the Moon Bingo social media sites too, so be sure to keep an eye out over on the Moon Bingo Facebook and Twitter sites daily. The promotions available at Moon Bingo are refreshed constantly throughout the year and can include daily, weekly and monthly prizes and rewards. New players can enjoy a fantastic new player bonus, details of which can be found via the link at the top of this page. Terms and conditions apply, and all players must be aged 18 or over. Other promotions include guaranteed wins on Moon’s Prize Wheel, the monthly Self Made Millionaire game, the special Racing Sweets bingo variant, and hours of free bingo with daily prizes of up to £900. Play £500 on any of your favourite games, and you’ll win a free spin of the exclusive Moon’s Prize Wheel. There are 12 guaranteed prizes up for grabs including bonus cash, coins, free spins and also mystery prizes. The Self Made Millionaire takes place on the 3rd Saturday of every month. Simply sign up for the game at 10pm, and be in with a chance of a share of £1000,000. Racing Sweets is a bingo variant, and is a fast paced game mixing bingo and slots. Join in the fun everyday with 20 jackpots an hour, and tickets cost just 5p a game. There are 4 free Bingo rooms available to all funded players, with mega jackpots ranging up to £500. Moon Bingo is registered to Cassava Enterprises Ltd in Gibraltar, and is licensed and regulated by the Gibraltar Gambling Commissioner and the UK Gambling Control Commission. The site is powered by the Dragonfish Bingo Software. You’ll be able to access both 75-ball and 90-ball bingo games at Moon Bingo which feature guaranteed high daily jackpots, 4 free bingo rooms, progressive jackpots and huge payouts throughout. Playing on progressive jackpot games with Moon Bingo could easily be your road to riches. The prize pot keeps growing the more you play, and you’ll be on the edge of your seat with excitement waiting for each mega jackpot to break. The 4 free bingo rooms are open daily between 12pm and 11:45pm GMT, so there are hours of fun to be had at completely no cost. Each room is unlocked after you have wagered a certain amount. Single deposits between £10 and £50 are required for access, and and you can win your share of £900 in daily prizes. There are also lots of fun bingo chat games on the go daily too! Join in for a chance to make new friends, and win some lovely bonuses along the way each day. If you feel the need for something a bit different, Moon Bingo also offer a fantastic selection of casino and slots. You’ll find over 350 popular slots titles including Fluffy Favourites and Emoji Planet, and there are also 11 casino table games too. These include Blackjack, Roulette, Dueces Wild and Baccarat, and there are also live casino options too. This is a really great feature compared to most other smaller sites, and you usually only find such a wide selection as this on the larger bigger branded sites. There are a great range of payment options available at Moon Bingo. Please read all terms and wagering requirements upon registration, as details are always subject to change. There really is nothing negative to say about this platform. It runs on fantastic software from a great brand, and the games and features are all top class. The fairy theme is kept to a minimum, so doesn’t become too overpowering and it still has a high quality and classy feel throughout. There’s enough bingo and gaming on offer to keep you entertained, and the promotions and jackpots are ever changing and always high. The brand motto is to “Dream Big. Win Bigger.” So try your luck out on a few days of free no deposit Bingo, and then give yourself a look in on those mega juicy jackpots.